Un genou: Fait pour comprimer ! Slevin JP et Al Emerg Med J. 2019 Mar;36(3):154-158. doi: 10.1136/emermed-2018-207966. OBJECTIVES: Haemorrhage control is a critical component of preventing traumatic death. Other than the battlefield, haemostatic devices, such as tourniquets or bandages, may not be available, allowing for significant avoidable blood loss. We hypothesised that compression of vascular pressure points using a position adapted from the martial art of Brazilian Jiu-Jitsu could be adapted to decrease blood flow velocity in major extremity arteries. METHODS: Knee mount compression was applied to the shoulder, groin and abdomen of healthy adult volunteer research subjects from Seattle, Washington, USA, from March through May 2018. Mean arterial blood flow velocity (MAV) was measured using ultrasound in the brachial and femoral arteries before and after compression. A MAV decrease greater than 20% with compression was deemed clinically relevant. RESULTS: For 11 subjects, median (IQR) MAV combining all anatomical locations tested was 29.2 (34.1, 24.1) cm/s at baseline and decreased to 3.3 (0, 19.1) cm/s during compression (Wilcoxon p<0.001). MAV was significantly decreased during compression for each individual anatomical position tested (Wilcoxon p≤0.004). Per cent (95% CI) MAV reduction was significantly greater than 20% for shoulder compression at 97.5%(94% to 100%) and groin compression at 78%(56% to 100%), but was not statistically greater for abdominal compression at 35%(12% to 57%). Complete vessel occlusion was most common with compression at the shoulder (73%), followed by groin (55%) and abdomen (9%) (χ² LR, p=0.018). CONCLUSION: The Brazilian Jiu-Jitsu knee mount position can significantly decrease blood flow in major arteries of the extremities. This technique may be useful for bleeding control after injury. Garrot jonctionnel: Pas si performant que cela ! Comparison of Three Junctional Tourniquets Using a Randomized Trial Design. Hemorrhage remains a leading cause of death in both civilian and military settings. Of preventable deaths from hemorrhage, a significant portion occurs from junctional wounds that are not amenable to traditional extremity tourniquets. Junctional tourniquets (JTQs) can potentially provide hemorrhage control by compressing the arteries at the junction of the trunk and extremities. The FDA has cleared 3 JTQ products: The Combat Ready Clamp (CRoC®), the Junctional Emergency Treatment Tool (JETT™), and the SAM® JunctionalTourniquet (SJT). However, little is known regarding which of these JTQs is superior in application time, effectiveness in pulse elimination, effectiveness during transport, and user preference. Active duty corpsmen (N = 49) were given standardized instruction and hands-on training with the CRoC®, JETT™, and SJT, then sequentially applied each JTQ unilaterally to a fellow study participant in a randomized order. Pulse elimination was determined by Doppler ultrasound at the dorsalis pedis immediately then reevaluated after a short transport. User preference data were collected following testing. Data were analyzed using repeated measures ANOVA and non-parametric statistics at p < 0.05. The CRoC® was significantly slower in application time than the JETT™ and SJT. Effectiveness was similar for CRoC®, JETT™, and SJT. 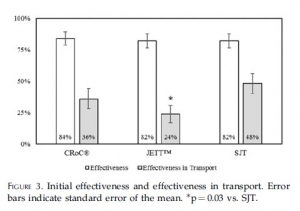 Effectiveness during transport was significantly higher for SJT than for the JETT™, but no JTQ performed well during transport (24-48% effectiveness). SJT ranked first in perceived ease of use, stability, and reliability, and in user trust and overall preference. Participants provided cogent suggestions for product improvement. All JTQ devices performed poorly during transport. Combined, present findings highlight the potential of JTQ products for saving lives threatened by junctional wounds, but also highlight the need for specific product improvements towards fostering JTQ performance in patient transport. Et pourquoi pas un ballonet pré-pelvien ? Minimally invasive preperitoneal balloon tamponade and abdominal aortic junctional tourniquet versus open packing for pelvic fracture-associated hemorrhage: Not all extrinsic compression is equal. On propose souvent la réalisation d'une hémostase temporaire par a pose de sondes à ballonet. Ce travail (partiellement déjà présenté en 2016) rapporte une expérience de ce type avec un produit initialement dédié à la chirurgie pariétale herniaire. La simplicité de sa pose et son efficacité semblent prometteurs du moins chez le cochon. Minimally invasive preperitoneal balloon tamponade (PPB) and abdominal aortic junctional tourniquets (AAJT) have been proposed as alternatives to open preperitoneal packing (OP) for the management of pelvic fracture-associated hemorrhage. We hypothesized that the PPB (SpaceMaker Pro) and AAJT would result in similar rates of survival and blood loss versus OP METHODS: 32 swine underwent creation of a combined open-book pelvic fracture and major iliac vascular injuries. Animals were randomized to no intervention (n=7), OP (n=10), PPB (n=9), or AAJT (n=6) at a mean arterial pressure <40 mmHg following initiation of uncontrolled hemorrhage. 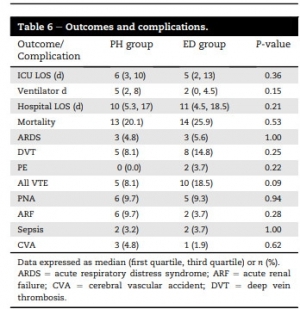 Survival (up to 60 min + 10 min after intervention reversal), hemodynamics, extraperitoneal pressures, blood loss, and associated complications were compared between groups. Prior to injury, no difference was measured between groups for weight, hemodynamics, lactate, and hematocrit (all p>0.05). The injury was uniformly lethal without intervention, with survival time (mean) of 5 min, peak preperitoneal pressure (PP) of 14 mmHg, blood loss of 960 g, and peak lactate of 2.6 mmol/L. Survival time was 44 min with OP vs. 60 min with PPB and AAJT (p<0.01). Peak PP (mmHg) was 19 with OP, 23 with PPB, and 23 with AAJT (p>0.05). Blood loss (g) was 850 with OP, 930 with PPB, and 600 with AAJT (p>0.05). Peak lactate (mmol/L) was 3.3 with OP, 4.3 with PPB, and 6.3 with AAJT (p<0.01). Only 33% of AAJT animals survived intervention reversal vs. 60% for OP and 67% for PPB (p<0.01). Necropsy revealed bowel/bladder injury in 50% of AAJT subjects vs. 0% in all other arms (p<0.01). PPB is a safe and potentially effective alternative to OP for the management of lethal pelvic fracture-associated hemorrhage. AAJT offers a similar survival benefit to PPB but has concerning rates of ischemia-reperfusion and compressive abdominal organ injury. Tourniquet: Comment sont ils testés ? La qualité des garrots mis à disposition des combattants est très importante. On peut penser que c'est le cas avec les fabricants ayant pignon sur rue. C'est le cas notamment de TAC MED Solutions (SOFT Tourniquet) et de CAT Ressources ( le CAT). Il existe des machines spécifiquement conçues pour ces tests. TXA à l'avant: Peut être pas si simple ! Prehospital Tranexamic Acid Administration During Aeromedical Transport After Injury. Un article de plus qui doit faire interroger sur l'intérêt réel du TXA, notamment son administration quai systématique à l'avant et pointe la réalité des complications thrombo-emboliques. Une plus grande sélectivité dans les critères d'administration est discutée. Tranexamic acid (TXA) has been shown to reduce mortality in the treatment of traumatic hemorrhage. This effect seems most profound when given early after injury. We hypothesized that extending a protocol for TXA administration into the prehospital aeromedical setting would improve outcomes while maintaining a similar safety profile to TXA dosed in the emergency department (ED). We identified all trauma patients who received TXA during prehospital aeromedical transport or in the ED at our urban level I trauma center over an 18-mo period. These patients had been selected prospectively for TXA administration using a protocol that selected adult trauma patients with high-risk mechanism and concern for severe hemorrhage to receive TXA. Patient demographics, vital signs, lab values including thromboelastography, blood administration, mortality, and complications were reviewed retrospectively and analyzed. One hundred sixteen patients were identified (62 prehospital versus 54 ED). Prehospital TXA patients were more likely to have sustained blunt injury (76% prehospital versus 46% ED, P = 0.002). There were no differences between groups in injury severity score or initial vital signs. There were no differences in complication rates or mortality. Patients receiving TXA had higher rates of venous thromboembolic events (8.1% in prehospital and 18.5% in ED) than the overall trauma population (2.1%, P < 0.001). Prehospital administration of TXA during aeromedical transport did not improve survival compared with ED administration. Treatment with TXA was associated with increased risk of venous thromboembolic events. Prehospital TXA protocols should be refined to identify patients with severe hemorrhagic shock or traumatic brain injury. Abdominal Aortic and Junctional Tourniquet release after 240 minutes is survivable and associated with small intestine and liver ischemia after porcine class II hemorrhage. Brännström A et Al.J Trauma Acute Care Surg. 2018 Oct;85(4):717-724. Uncontrolled hemorrhage is a leading cause of tactical trauma-related deaths. Hemorrhage from the pelvis and junctional regions are particularly difficult to control due to the inability of focal compression. The Abdominal Aortic and Junctional Tourniquet (AAJT) occludes aortic blood flow by compression of the abdomen. The survivability of tourniquet release beyond 120 minutes is unknown and fluid requirements to maintain sufficient blood pressure during prolonged application are undetermined. We therefore compared 60-minute and 240-minute applications and release of the AAJT for 30 minutes, with crystalloid fluid therapy, after a Class II hemorrhage. Sixty-kilogram anesthetized pigs were subjected to 900-mL hemorrhage and AAJT application for 60 minutes (n = 5), 240 minutes (n = 5), and fluid therapy only for 240 minutes (n = 5) and reperfusion for 30 minutes. The AAJT application was hemodynamically and respiratory tolerable for 60 minutes and 240 minutes. Cumulative fluid requirements decreased by 64%, comparable to 3000 mL of crystalloids. Mechanical ventilation was impaired. AAJT increased the core temperature by 0.9°C compared with fluid therapy. Reperfusion consequences were reversible after 60 minutes but not after 240 minutes. A 240-minute application resulted in small intestine and liver ischemia, persisting hyperkalemia, metabolic acidosis, and myoglobinemia, suggesting rhabdomyolysis. The AAJT application for 240 minutes with reperfusion was survivable in an intensive care setting and associated with abdominal organ damage. 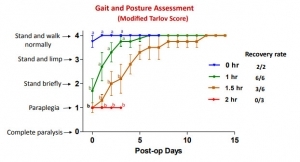 Long time consequences and spinal cord effects was not assessed. We propose an application time limit within 60 minutes to 240 minutes, though further studies are needed to increase the temporal resolution. The AAJT application may be considered as a rescue option to maintain central blood pressure and core temperature in cases of hemorrhagic shock from extremity bleedings, if fluid therapy is unavailable or if the supply is limited. Kheirabadi BS et Al. J Surg Res. 2018 Nov;231:99-108. Specialized tourniquets have been deployed to the battlefield for the control of junctional/pelvic hemorrhage despite limited knowledge concerning their safety and duration of use. This study investigated long-term effects of abdominal application of the abdominal aortic and junctionaltourniquet (AAJT) in a swine survival model. Anesthetized spontaneously air-breathing swine were subjected to bilateral femoral artery injuries and subsequent 40% hemorrhage. Further hemorrhage was controlled by applying the AAJT on the lower abdomen for 0 h (n = 2, controls), 1 h (n = 6), 1.5 h (n = 6), or 2 h (n = 3). Before tourniquet release, arterial injuries were repaired, and mechanical ventilation and rapid crystalloid fluid were provided for at least 5 min. Additional fluid and 500 mL autologous blood were transfused after restoring blood flow. Animals were recovered and their mobility and health monitored up to 2 wk. AAJT application occluded the infrarenal abdominal aorta and stopped bilateral groin hemorrhage with rapid reversal of hemorrhagic shock and improved cranial blood pressure. All animals including controls recovered overnight but regaining hind leg function varied among AAJT-treated groups. In contrast to 1 h AAJT-treated swine that recovered full mobility in 1 wk, 2 h animals developed persistent hind leg paraplegia concurrent with urinary retention and ischemic necrosis of lumber muscles and had to be euthanized 3 d after surgery. Half of the 1.5-h group also had to be euthanized early due to paraplegia, whereas the other half recovered motor function within 2 wk. En attendant le REBOA: Une paire de main ou un genou ! Proximal External Aortic Compression for Life-Threatening Abdominal-Pelvic and Junctional Hemorrhage: An Ultrasonographic Study in Adult Volunteers. Il existe un grand engouement pour la mise en place de REBOA en préhospitalier. Il s'agit d'une technique d'occlusion bien relativement ancienne mais qui s'est simplifiée avec l'apparition de kits spécifique. Il s'agit néanmoins d'une technique qui nécessite une formation préalable et qui s'intègre dans une stratégie globale. Cela ne doit pas occulter le fait qu'il est possible de comprimer par voie externe l'aorte abdominale (1). C'est ce que permettent l'abdominal tourniquet et la compression abdominale bimanuelle. Cet article met en avant la simplicité de sa mise en oeuvre et son efficacité, par ailleurs difficile à maintenir dans le temps. Ils proposent d'intégrer cette manoeuvre en attendant l'équipe permettant la mise en place d'un REBOA (2). Il s'agit cependant d'une technique difficile à maintenir dans le temps. Les mêmes auteurs préconisent de réaliser ce geste avec le genou (3, 4). Following life-threatening junctional trauma, the goal is to limit blood loss while expediting transfer to operative rescue. Unfortunately, life-threatening abdominal-pelvic or junctional hemorrhage is often not amenable to direct compression and few temporizing strategies are available beyond hemostatic dressings, hypotensive resuscitation, and balanced transfusion. 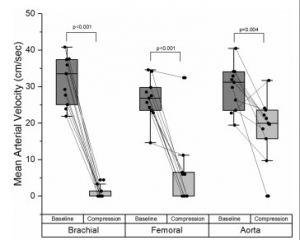 In this study, we evaluated proximal external aortic compression to arrest blood flow in healthy adult men. This was a simulation trial of proximal external aortic compression, for life-threatening abdominal-pelvic and junctional hemorrhage, in a convenience sample of healthy adult male volunteers. The primary end points were cessation of femoral blood flow as assessed by pulse wave Doppler ultrasound at the right femoral artery, caudal to the inguinal ligament. Secondary end points were discomfort and negative sequelae. Aortic blood flow was arrested in 12 volunteers. Median time to blood flow cessation was 12.5 seconds. Median reported discomfort was 5 out of 10. No complications or negative sequelae were reported. 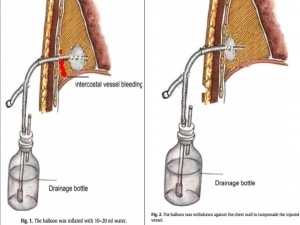 This trial suggests that it may be reasonable to attempt temporization of major abdominal-pelvic and junctional hemorrhage using bimanual proximal external aortic compression. In the absence of immediate alternatives for this dangerous and vexing injury pattern, there appear to be few downsides to prehospital proximal external aortic compression while concomitantly expediting definite care. Voies aériennes et choc hémorragique, que faire ? Primum non nocere. Souvent ne pas faire parce que c'est le plus prudent ET NON PAS PARCE QU'ON N'A PAS APPRIS ET QU'ON NE SAIT DONC PAS FAIRE. Many standard trauma management guidelines advocate the early use of endotracheal intubation (ETI) and positive pressure ventilation as key treatment interventions in hemorrhagic shock. The evidence for using these airway and ventilation strategies to manage a circulation problem is unclear. The potentially harmful effects of drug-assisted intubation and positive pressure ventilation include reduced cardiac output, apnea, hypoxia, hypocapnea (due to inadvertent hyperventilation), and unnecessarily prolonged on-scene times. Conversely, the beneficial effects of spontaneous negative pressure ventilation on cardiac output are well described. Few studies, however, have attempted to explore the potential advantages of a strategy of delayed intubation and ventilation (together with a policy of aggressive volume replacement) in shocked trauma patients. Given the lack of evidence, the decision making around how, when, and where to subject shocked trauma patients to intubation and positive pressure ventilation remains complex. If providers choose to delay intubation, they must have the appropriate skills to safely manage the airway and recognize the need for subsequent intervention. If they decide to perform intubation and positive pressure ventilation, they must understand the potential risks and how best to minimize them. We suggest that for patients with hemorrhagic shock who do not have a compromised airway and who are able to maintain adequate oxygen saturation (or mentation if monitoring is unreliable), a strategy of delayed intubation should be strongly encouraged. Plaquettes et golden hour: Possible ? Intravenous synthetic platelet (SynthoPlate) nanoconstructs reduce bleeding and improve 'golden hour' survival in a porcine model of traumatic arterial hemorrhage. Hickman DA et Al. Sci Rep. 2018 Feb 15;8(1):3118. Traumatic non-compressible hemorrhage is a leading cause of civilian and military mortality and its treatment requires massive transfusion of blood components, especially platelets. However, in austere civilian and battlefield locations, access to platelets is highly challenging due to limited supply and portability, high risk of bacterial contamination and short shelf-life. To resolve this, we have developed an I.V.-administrable 'synthetic platelet' nanoconstruct (SynthoPlate), that can mimic and amplify body's natural hemostatic mechanisms specifically at the bleeding site while maintaining systemic safety. Previously we have reported the detailed biochemical and hemostatic characterization of SynthoPlate in a non-trauma tail-bleeding model in mice. Building on this, here we sought to evaluate the hemostatic ability of SynthoPlate in emergency administration within the 'golden hour' following traumatic hemorrhagic injury in the femoral artery, in a pig model. We first characterized the storage stability and post-sterilization biofunctionality of SynthoPlate in vitro. The nanoconstructs were then I.V.-administered to pigs and their systemic safety and biodistribution were characterized. Subsequently we demonstrated that, following femoral artery injury, bolus administration of SynthoPlate could reduce blood loss, stabilize blood pressure and significantly improve survival. Our results indicate substantial promise of SynthoPlate as a viable platelet surrogate for emergency management of traumatic bleeding. Chitine: Prudence quand même ? Les pansements hémostatiques à base de chitine sont largement utilisés et ne semblent pas actuellement poser de problème allergique (1). Néanmoins se pose la question de leur innocuité immune. Le développement des allergies croisées avec les produits dérivés de la mer et l'emploi de chitine comme complément alimentaire sont autant de facteurs de rencontre avec un allergène vrai. De telles allergies croisées s'observent également avec d'autres composants tels que la paravalbumine et le collagène des produits de la mer. Les pansements hémostatiques ne contenant pas de chitine ne semble pas exposer à ce risque potentiel. Chitin, a potential allergy-promoting pathogen-associated molecular pattern (PAMP), is a linear polymer composed of N-acetylglucosamine residues which are linked by β-(1,4)-glycosidic bonds. Mammalians are potential hosts for chitin-containing protozoa, fungi, arthropods, and nematodes; however, mammalians themselves do not synthetize chitin and thus it is considered as a potential target for recognition by mammalian immune system. Chitin is sensed primarily in the lungs or gut where it activates a variety of innate (eosinophils, macrophages) and adaptive immune cells (IL-4/IL-13 expressing T helper type-2 lymphocytes). Chitin induces cytokine production, leukocyte recruitment, and alternative macrophage activation. Intranasal or intraperitoneal administration of chitin (varying in size, degree of acetylation and purity) to mice has been applied as a routine approach to investigate chitin's priming effects on innate and adaptive immunity. Structural chitinpresent in microorganisms is actively degraded by host true chitinases, including acidic mammalian chitinases and chitotriosidase into smaller fragments that can be sensed by mammalian receptors such as FIBCD1, NKR-P1, and RegIIIc. Immune recognition of chitin also involves pattern recognition receptors, mainly via TLR-2 and Dectin-1, to activate immune cells to induce cytokine production and creation of an immune network that results in inflammatory and allergic responses. In this review, we will focus on various immunological aspects of the interaction between chitin and host immune system such as sensing, interactions with immune cells, chitinases as chitin degrading enzymes, and immunologic applications of chitin. Chao BF et Al. Injury. 2011 Sep;42(9):958-9.